The use of the right technology stack is the essence of a successful digital product. But choosing the right blend of technology is always tricky. At GoodWorkLabs, we offer an expert tech consultation that is unique for every digital product in question. In this post, we have given a more generalized road to help you choose the right tech stack for your application. We are laying down all the possible options for your reference so that you can manifest the right blend for your brand. In layman’s language, web app development requires a database, a server, HTML+CSS, and programming language. All these layers put together, form a tech stack for web development. Customizable, saves time, easy to use with a bunch of other helpful components. Recommended when you are opting for a ‘mobile first’ application. It is recommended for developing single-page web applications, cross-platform mobile apps, landing pages, and common websites. It is recommended for large-scale and single-page projects. It is recommended for web applications or platforms which require a very responsive UI. PHP is particularly designed for web development and creating dynamic web pages. Though it had certain vulnerabilities, it is considered to be the most popular language. Also, as PHP based apps are easy to code, it means that you can cut greatly on expenses by saving time. Java is well-documented and supports numerous libraries. It is used widely for both complex website and dynamic mobile apps. The popular frameworks are Hibernate, Grails, Spring, Dropwizard, and Apache Wicket. With the capability of processing heavy data flow and the flexibility to create all kinds of application, C# is a popular cross-platform technology among developers. One of the popular tech stack among startups, ROR is perfect for all kinds of apps from basic web pages to high-traffic web portals. RoR is already used by Airbnb, Basecamp, Twitch, Shopify, and Zendesk. Django is versatile and can be used for startups, medium-sized projects, and high-loaded websites. It is a clean, secure, fast, and scalable framework for rapid development. Along with being well-documented, it comes with its own lightweight server. Already used by Discus, Mozilla, Instagram, and National Geographic. .NET allows developing any type of web app faster and making it scalable. It is very easy to add APIs and live communication features. It has an active community and is extensively documented. Node.js allows optimizing code on complex, high-performance, and data-intensive real-time apps. It is simple, fast, and expressive. It is recommended for apps that involve real-time streaming, collaboration tools, and chatting. As the name suggests Express.js is a minimalist, flexible, and resource-efficient framework which uses templates and requires minimum efforts. It is recommended for APIs and simple web and mobile services. Flask is another well-documented framework with a highly active community. It is recommended when the client requires to build a service on a resource-constrained system. Also, it is good for serious websites and RESTful APIs. MongoDB is a NoSQL, document-based database which can be used for storing large volumes of unstructured data. It can also be used in a cloud-based environment. PostgreSQL has multi-version control and supports custom data types. Basically, it is an object-relational database with NoSQL features and is used for storing a gigantic volume of data (up to 32 TB per table). The plus points of this most popular relational database are that MySql is highly scalable, easy to set up, cloud-reafy and is platform independent. You can also pick from already designed popular web stack. They have a solid foundation and you can easily customize them as per your requirements. The major tech stacks that have been used are LAMP(Linux-Apache-MySql-PHP), MEAN (MongoDB-Express.js-Angular-Node.js) and .NET. 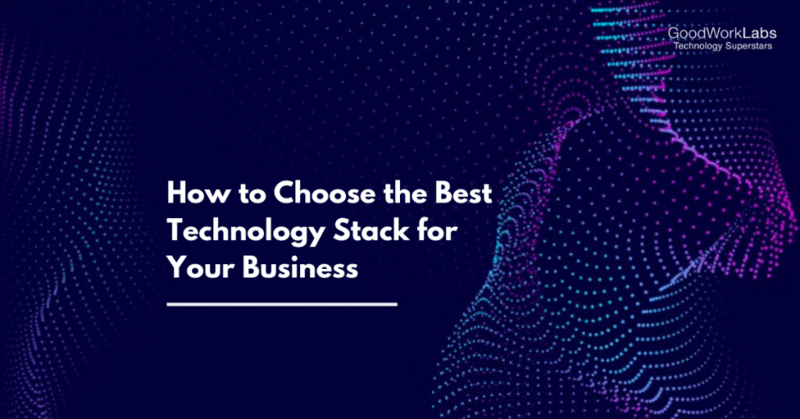 The success of your project majorly depends on the tech stack that you choose in the beginning. With so many fishes in the pond, it is difficult to say which one will work best for you. But GoodWorkLabs can help!